Tucked away in the centre of lawyers Abode near Kala Ghoda, a dimly lit bar with a very warm ambience. It is perfect for a drink or two after a long day at work. It opens at 6 in the evening. It is one of the rare places, that serves Pure Vegetarian Food and has a bar. There is a honeycomb grid pattern followed throughout on the bar seeping down to the floors as well on some parts of the wall giving it a very modern chic vibe. The large mirrors used on the wall give an illusion of a larger space. There’s a full height metal grid bar stocked from top to bottom. As you enter the first thing you notice is the ‘Honesty Bar’. It is a very new concept, not only for the city but India in general. Honesty Bar is a unique concept which goes back in time around the colonial era. Dutch & British colonies flaunted many honesty bars. 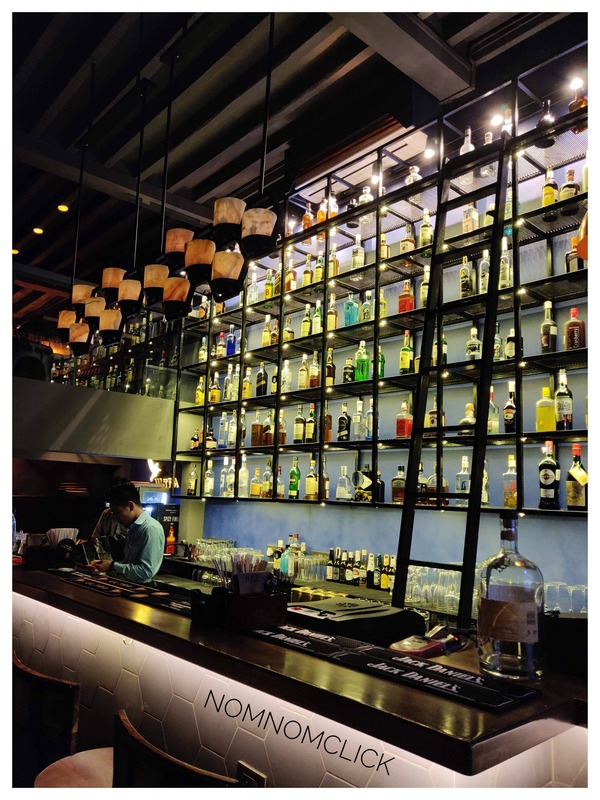 It is most popular in South Africa and hence the owners Gaurish Rangnekar and Alok Nanda came up with this moral and spiritful concept: A BAR WITHOUT A BARTENDER. Honesty Bar is an unattended beverage bar, where it is left to the honesty of the guest to report his/her consumption to the restaurant. It’s a contract of trust between the Restaurant and its guest, who are allowed to feel the liberty of making their drink. Honesty bars are convenient since the guests can make or serve a drink at any time. You will enjoy making yourself at home, and the rates are such that you’ll find it more appealing than a regular bar. It’s a tiny bar to your right as you enter. A board is displayed explaining the concept. They have a set of 3 exclusive imported drinks, which change on a weekly basis owing to the availability and sale. The timing for this honesty bar is 6 pm to 8 pm. The pricing goes from INR 140-180-220 (Fair-Good-Excellent). You can pay as you like. No questions asked. There is also a full-fledged main bar with a gigantic stock of one of the largest inventory of mid to top-shelf labels to choose from. The USP for their cocktails is their glasses and the presentation, which goes with the name and concept of the drink. There’s a meaning behind every drink's name and ingredients. These cocktails are an amazing concoction of various flavours and an amalgamation of some really unique ingredients. The cocktails are exclusively the creation of Gaurish Rangnekar. Cocktails: All of them were 5/5. As every cocktail had a unique taste. Pour Homme: Typically translated, it means “For Him” in French. A Robust Macho Cocktail they say and it truly is. Strong Bourbon with Zesty Maple Syrup Absinthe Mist and Bitters. And with an Orange Peel Moustache making it appealing even to the eyes. Let’s Tweet: Served in an innovative bird shaped glass. Very unique. Based on Guava Juice and Chilli Based Vodka does complete justice to its name ‘Tweet’ which are with a lot of gossips. Spa Time: Very calming refreshing drink. It is so called as it has Lemongrass which is usually the aroma at any Spa you enter for its soothing ability. The Kaffir leaves infused Vodka is perfect after a tiring day. Botanical Breakfast: Gin with some strawberry jam, Lime juice and sparkling wine. Our Personal Favourite at HYDE. A very Refreshing drink, it's a little on the sour side but depends on how you like your drink. We absolutely loved this one. Cocoane: Yes, it’s the legal one. Made of Crème de Cocoa, Sugarcane juice, Rum and chocolate bitters. Served with a line of chocolate powder. There’s a distinct taste when you try the drink after ‘sniffing’ the chocolate and after cleansing your palate. Food: It is mainly concentrated on appetizers which go along well with drinks. There’s a large selection range for the appetizer, the mains are limited. The Dishes are not concentrated on a single cuisine and have a bit of everything from Asian, Continental, Mexican and Indian. Mushrooms on Sago Chips: 5/5 Their best seller. Mushrooms tossed in Soya Garlic sauce, served on Sago (edible starch which is obtained from a palm commonly known as Sabudana in Gujarati/Marathi). Butter Garlic Water Chestnuts: 5/5. A perfect blend of Water chestnuts and bell peppers tossed In this garlic and butter sauce where you get a reminiscent taste of both garlic and butter in every bite. Usually, in such dishes, the taste of garlic overpowers the butter, but this wasn’t the case here. Bourbon BBQ Cottage Cheese: 4/5. Cottage Cheese pieces in Barbeque sauce. The Bourbon Is heated and poured on this preparation once it is bought to your table. Soya Boti Kebab: 4/5 Small bites of Mock meat made of soya, having a spicy tikka flavour. Must try if you like spicy food. Soya Kheema Pav: 5/5 This was recommended by them and trust us, you don’t want to miss on this. This vegetarian Soya Kheema was absolutely delicious. Served with pav drowned in butter, you’ll keep wanting more of it. The staff was very well versed with the menu, both the Food and the Drinks. Very attentive and quick in service, these guys know the menu in and out and give some killer recommendations. Every appetizer and Cocktail was explained very nicely when we were ordering. HYDE also has a resident DJ to play music of different genres such as Deep House, Electro Jazz, Commercial EDM etc. Considering its placement in South Bombay, the pricing is very economical compared to other Bars. They also have a special deal for the Lawyers every Wednesday Night 8 p.m. onwards. Buy one get one free on selected spirits. Ticking all the boxes from Food, Hospitality, New Concept, Innovative Drinks, Casual bar till 8 to a full swing party place after, HYDE is surely pleasing the need of the hour.